October 20, 2016 – Troy Widgery, Founder of GoFast! Energy Drink and mastermind behind the Apollo JetPack, has spent nearly eight years and over 600 formulas developing another cutting edge product: a unique energy supplement delivery system. Widgery’s goal for the GoFast! Company was to create a healthy, good tasting energy drink. Apollo is a natural evolution of portable, concentrated and long-lasting energy on the go. Today, Widgery’s new enterprise, Apollo Gum Company, will officially launch Apollo Energy Gum in the US and Europe. 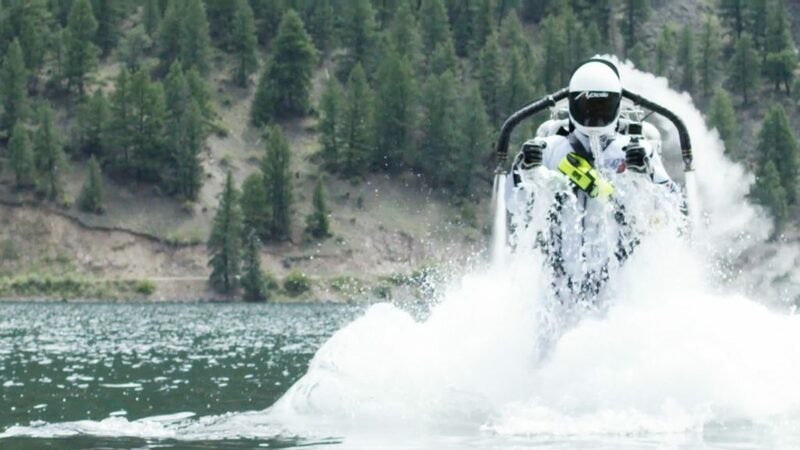 Apollo Gum Company and the Apollo JetPack recently performed an extreme water stunt at Lake San Cristobal, Colorado, for Apollo’s official launch announcement. The JetPack pilot emerged from beneath the waters of Lake San Cristobal, soared 510 feet across the lake and landed the 800-horsepower rocket-powered jetpack on the edge of a cliff. You can see the stunt video here. Apollo Energy Gum is one of the fastest-acting sources of energy in the world due to its innovative delivery system that instantly boosts the user’s energy levels. The liquid center of the gum, which contains vitamins B3, B6 and B12, 80 mg of caffeine and zero sugar, absorbs through the lining of the mouth and is delivered directly into the bloodstream, providing energy up to five times faster than other energy supplements. Apollo’s shell has more Xylitol than any Xylitol gum on a market. Xylitol is a natural sweetener that helps to prevent cavities, repairs tooth enamel and can strengthen the immune system. Apollo Energy Gum is also free from Aspartame and Acesulfame. “We are very excited to finally share our product. Apollo is about to change the energy market completely. Apollo is unique. It tastes great, is portable, and good for your body and teeth. Think of it as your new pre-workout or energy on the go,” shared Boyd Wilkinson, Director of Brand Development. With headquarters in Colorado, Apollo Gum Company is providing a clean, healthy, portable and affordable alternative to other energy supplements.